New York, New York. Publisher: Office of the Instructive Light, Alfred A. Hart, Agent. 1/1, August 1880. 10 cents a copy, $1.00 a year, postpaid. 4 pp, 10 x 14. A bookseller's catalogue entry (Mare Booksellers, 2012) describes the journal: "A newspaper devoted to printing spirit communications from the deceased, publishing predictions of near future events on Earth, as well as accounts of the afterlife and spiritual philosophy. Of note is a communication from Abraham Lincoln, endorsing Winfield Scott Hancock and predicting his defeat of James Garfield for president of the United States. Text banners beneath the upper margin explain the way the communications are received, through electric and magnetic currents projected and received." The journal offered "telephonic communications via The Mirror of Light," a process likened to the use of the Thummin of the Bible. This operated by electric or magnetic current and placed the recipient's light in a "spiritual chord" with the "Spirit Light," thus enabling communications with the spirits of the dead (and presumably other entities). No mention is made of the use of crystals or the magic mirror, but such use would seem to be implied. 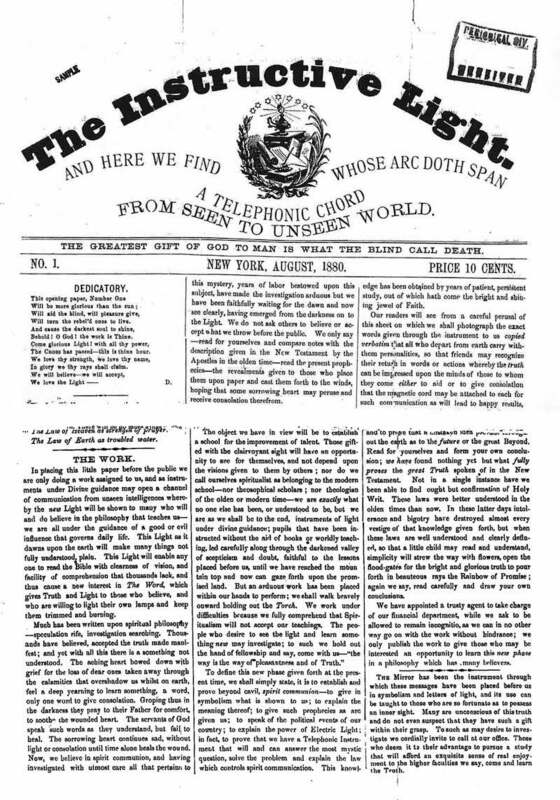 The editor's stated goal was the establishment of a school to develop "clairvoyant sight" so believers "could see for themselves, and not depend upon the visions given to them by others.